Toronto, Ontario--(Newsfile Corp. - January 18, 2019) - Pancontinental Resources Corporation (TSXV: PUC) ("Pancon" or the "Company") announced today it has entered into a binding letter of intent ("LOI") with Pelangio Exploration Inc. (TSXV: PX) to acquire up to a 75% interest in the Strachan Project, covering 2,280 hectares within the Montcalm Greenstone Belt, 65 kilometres northwest of Timmins, Ontario. Strachan is Pancon's fourth early stage Ni-Co-Cu exploration project in the emerging Montcalm battery and energy metals district, and it consolidates Pancon's control over most of the highly prospective gabbro intrusives across 15,760 hectares. The Strachan Project binding letter of intent (LOI) forms the basis for an Option and for a future Joint Venture Agreement. Under the binding LOI, Pancon can earn a 60% interest in the Strachan Project for total cash payment of C$40,000 and issuance of 400,000 common shares over an initial three-year period as well as a C$250,000 work commitment over those three years, including C$50,000 within the first year. Pancon can earn a further 15% interest, for a total 75% interest in the Strachan Project, by completing an additional C$500,000 work commitment over an additional three-year period. Pancon President and CEO, Layton Croft, stated: "Pancon now controls more than 157 square kilometres in a proven nickel-cobalt-copper mining location west of Timmins. Glencore's former Montcalm Mine property covers less than 5 square kilometres of the Montcalm Gabbro Complex. With Strachan, in addition to our Montcalm, Gambler and Nova projects, Pancon is the dominant player in an emerging battery and energy metals exploration district. Pelangio is an excellent company led by high quality exploration and mining professionals, and we are excited to be their partner." The Strachan Project covers 22.8 square kilometres and is located in Strachan and Melrose Townships, due south of Montcalm Township. 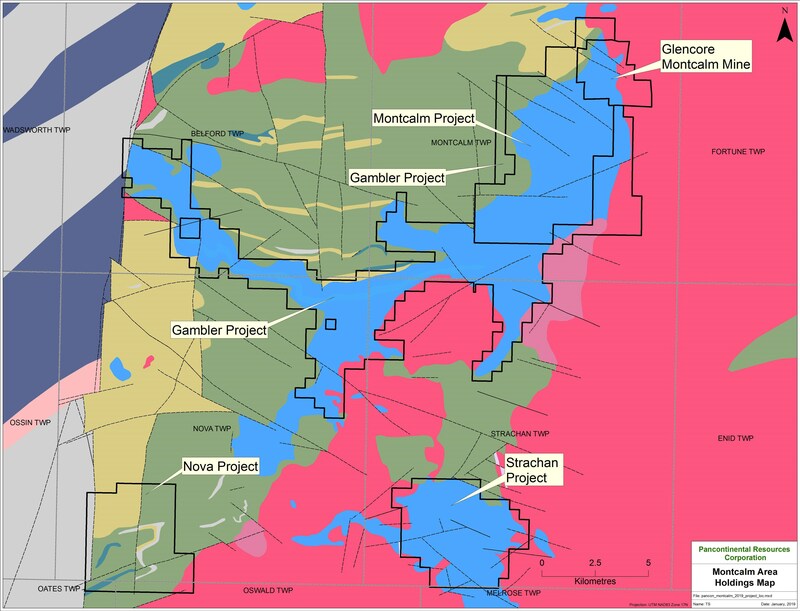 The Strachan Project is approximately 5 kilometres south of Pancon's Gambler Project, 10 kilometres east of Pancon's Nova Project, 13 kilometres south of Pancon's Montcalm Project, and 19 kilometres south of Glencore's former Montcalm Mine. The map below shows the regional Gabbro Complex intrusive geology in blue. The former Montcalm Mine is hosted in the Montcalm Gabbro Complex, which is the same geology hosting Pancon's Montcalm and Gambler Projects. The Strachan Project is hosted by the Strachan Gabbro Complex, geologically similar to the Montcalm Gabbro Complex. The Montcalm Mine was discovered and developed based on a single airborne electromagnetic anomaly identified in the 1970s and previously mined 3,931,610 tonnes of ore grading 1.25% nickel (Ni), 0.67% copper (Cu), and 0.051% cobalt (Co), producing in excess of 4 million pounds of Co (Ontario Geological Survey, Atkinson, 2011). Pancon cautions that the mineralization on the former Montcalm Mine is not necessarily indicative of the mineralization that may be identified on the Strachan Project. Pancon intends to explore the Strachan Project by using both state-of-the-art airborne versatile time domain electromagnetic (VTEM) and airborne gravity geophysical surveys. This is the same approach the Company took in 2018 at the nearby Montcalm Project, which resulted in successful delineation of more than a dozen new high priority targets not detected by previous operators over the past four decades. In addition, the Company announces that it has granted a total of 1,100,000 options to directors, officers, consultants and an advisor of the Company to purchase common shares at an exercise price of $0.08 cents per common share, expiring on January 17, 2024. The technical information in this news release has been prepared in accordance with Canadian regulatory requirements as set out in NI 43-101 and reviewed and approved by Kevin Filo, P.Geo., a Qualified Person as defined by NI 43-101, a member of Pancon's Technical Advisory Committee, and Pancon's Project Advisor for the Montcalm, Nova, Gambler and now Strachan Projects. Certain technical information within this news release is historical in nature and pre-dates NI 43-101 standards, this information is believed to be reliable however the Company has not verified this material. Pancontinental Resources Corporation (TSXV: PUC) is a Canadian-based exploration company with five nickel-cobalt-copper projects in Ontario - four within the Montcalm Greenstone Belt near Timmins: Montcalm Project, Gambler Project, Nova Project and Strachan Project; and the McBride Project near Bancroft. Pancon's mission is to generate value through responsible exploration, focusing on prospective battery metals assets in proximity to former/producing mines or existing resources. The Company holds a 100% interest in the Jefferson Gold Project near the Haile gold mine in South Carolina, USA. In 2015, Pancon sold its interest in its Australian rare earth element (REE) and uranium properties, formerly held through a joint venture, and retains a 1% gross overriding royalty on 100% of future REE production.